The European Language Gazette, the ECML's e-newsletter, provides up-to-date news about the ECML (events, projects, resources), the Language Policy Unit and other relevant sectors of the Council of Europe, as well as our partners. It focuses on national developments in the field of language education in the member states and beyond. 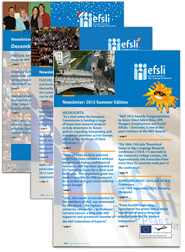 EFSLI Newsletter: Results of the ECML project "PRO-SIGN-Signed languages for professional purposes"
Language Policy Unit: Intergovernmental Conference on "The language dimension in all subjects: equity and quality in education"
47th Meeting and Conference of ALTE "The concept of quality in language education"
22nd ICC Annual Conference 2015 "Languages at work 2020"
XIV CercleS International Conference 2016 "Enhancing learners’ creative and critical thinking: the role of university language centres"
At its 24th meeting on 23 October the Governing Board of the European Centre for Modern Languages unanimously adopted the Centre’s 2016-19 programme entitled “Languages at the heart of learning” and acknowledged the importance of this new programme in addressing major challenges in language education in member states. The programme is structured around three key work strands: Development, Training and Consultancy, and Mediation which together form a cohesive, yet dynamic whole. The 2015 European Day of Languages offered a showcase for a wide variety of creative initiatives around the globe: A huge number of events celebrating languages and language diversity took place on or around 26 September. Depending on your interests (and transport!) it was possible to attend a series of workshops in Belgrade, a language fair in Strumica ("the former Yugoslav Republic of Macedonia"), express language courses on trains between Clermont-Ferrand and Vichy, a sign language event in Belfast, a language festival to promote the multiple home languages of the children in Luxembourg, literary flashmobs in 13 cities of South America or to try out "surviving shopping in a foreign language" in Sofia or "speak dating" in Hong Kong. Migration this year was a frequent theme with many activities focusing on integration and the teaching methods required to rapidly develop basic communicative skills for new arrivals in the language of the host country. With over 900 events registered on the EDL website and 1.1 million page views of the site in September, this proved to be a record-breaking year. The website is now available in 31 access languages with Finnish, Georgian and Hungarian all added - thanks to the National Relays. A new map feature displaying details of the events taking place in different countries offers a quick way of finding out what is going on where. With over 100 activities recorded in the calendar Austria proved the most popular country for EDL. The network of National Relays again played a key role in promoting the Day. On 25 September 2015, challenges of multilingualism in schools, business and society were the subject of the web-streamed debate “Multilingualism: an asset for Europe and a shared commitment” held in 24 languages and organised by the European Commission in Brussels. In Graz, despite the rain, as many as 2000 people flocked to the island on the river Mur and the other EDL venues around the city to celebrate the Day. On the island visitors were spoilt for choice with multilingual theatre, quizzes, language taster sessions and a lively programme of music and choirs reflecting different cultures around Europe and the world. This year the Council of Europe statement focused on the Recommendation on the relevance of the languages of schooling for educational success. The recommendation offers Member States concrete measures to help ensure that all pupils can reach their educational potential. The winner of 2015’s most innovative EDL event, with over 18,000 votes, was Dubrovnik’s “Let's Celebrate Europe's Linguistic Diversity” initiative organised by Europe House. Congratulations to this year's winners and indeed to all this year’s event organisers for a highly enjoyable and successful European Day of Languages! Babylonia dedicates its latest issue to pluralistic approaches to languages and cultures - in other words, to teaching orientations that prepare learners for multilingualism and interculturalism while strengthening their motivation to learn. The contribution focuses on several projects within the current ECML programme (FREPA, MALEDIVE, PARENTS), in particular highlighting the importance of the Framework for pluralistic approaches to languages and cultures (FREPA) in the context of the ECML. Slivensky, Susanna, Der Referenzrahmen für plurale Ansätze (REPA) – Ein Meilenstein in der Arbeit des Europäischen Fremdsprachenzentrums des Europarates (EFSZ), in: Babylonia 2/2015. Rathmann, Christian / van den Bogaerde, Beppie / Haug, Tobias / Leeson, Lorraine (2015), “The Common European Framework of Reference and Signed Languages: Results of the ProSign: Signed Languages for Professional Purposes project, EFSLI Newsletter, Summer Edition July 2015, p. 12-13. Translated into Persian by Mr Majid Elahi Shirvan, Assistant Professor, University of Bojnord, Iran. The European Portfolio for Student Teachers of Languages (EPOSTL) seeks to help prepare students for their future profession in a variety of teaching contexts. The EPOSTL can also facilitate discussion of aims and curricula between teacher educators working within different national or European contexts. 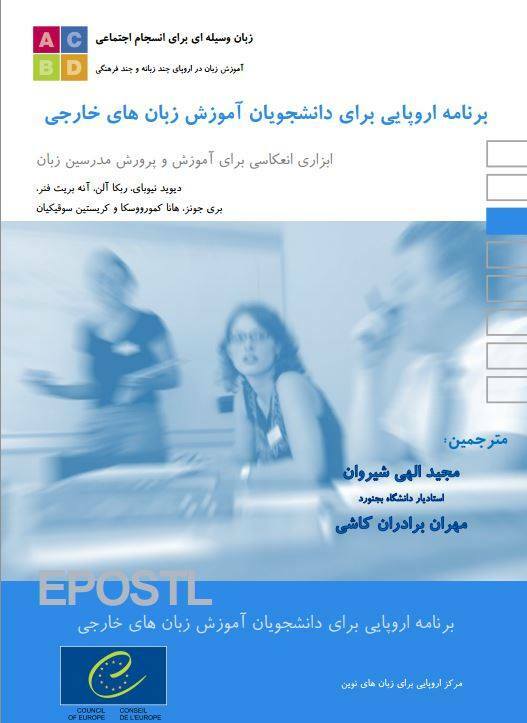 The EPOSTL is available for free in 15 language versions. Council of Europe Language Policy Unit: Intergovernmental Conference on "The language dimension in all subjects: equity and quality in education"
An Intergovernmental Conference on "The language dimension in all subjects: equity and quality in education", organised by the Language Policy Unit of the Council of Europe, took place in Strasbourg on 14-15 October 2015. The ECML contributed to this major event which focused on the teaching and learning of the language(s) for schooling. Significant work carried out by the ECML in this area was highlighted in the presentation of the Centre. All presentations of this event can be accessed through the programme. A report of the conference is being prepared. This book which aims to support teachers in their efforts to promote democracy through and in education, was developed within the Council of Europe Pestalozzi Programme Community of Practice. The handbook for practitioners in formal and non-formal educational settings contains a rationale for the need to focus on competences for democracy in all areas of education, an explanation of what transversal attitudes, skills and knowledge mean and why they are important for and should be taken on board by all education professionals. Mompoint-Gaillard, Pascale / Lázár, Ildikó (2015). 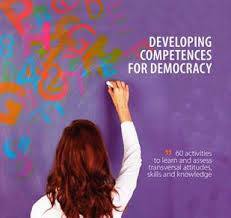 TASKs for Democracy – 60 activities to learn and assess transversal attitudes, skills and knowledge. Strasbourg: Council of Europe, Pestalozzi Series Book 4. The Council of Europe’s Education Department, in co-operation with numerous international experts, has developed a new theoretical model of Competences for Democratic Culture. A bank of descriptors has been compiled to help educators assess the extent to which a learner has acquired these competences. Now education professionals at all levels and in all areas are invited to respond to an online questionnaire to test the clarity and relevance of these descriptors. The Competences for Democratic Culture web page on the Council of Europe’s Education website provides a brief explanation of the project and the aim of survey. It will take about 45 minutes to answer the online questionnaire which is available in several languages. The final full reference framework, comprising the model, descriptors and various support documents, will be published at the end of 2017. We would also be very grateful if you could send this link to your contacts and networks and encourage them to take part in this online consultation. The 47th Meeting & Conference of ALTE (The Association of Language Testers in Europe) will take place in Perugia, Italy, from 11-13 November 2015. The theme of the conference day on 13 November will be "The concept of quality in language assessment". ALTE is a member of the ECML Professional Network Forum and has invited Sarah Breslin, Executive Director of the ECML, to give a plenary talk entitled "Quality in language education and the role of the ECML". A Workshop and Conference linking proven and successful approaches to language learning/teaching with innovative technology and the social media. Keynote speakers/panel of experts: Sarah Breslin, Executive Director, ECML, Council of Europe; Josef Huber, Head of the Pestalozzi Programme, Council of Europe; Ian McMaster, Editor-in-Chief, Business SPOTLIGHT, SPOTLIGHT Verlag; Professor Bernd Rüschoff, Chair of Applied Linguistics, University of Duisburg Essen, President of AILA; Frank Heyworth, EAQUALS Association; Michael Carrier, Cambridge English. 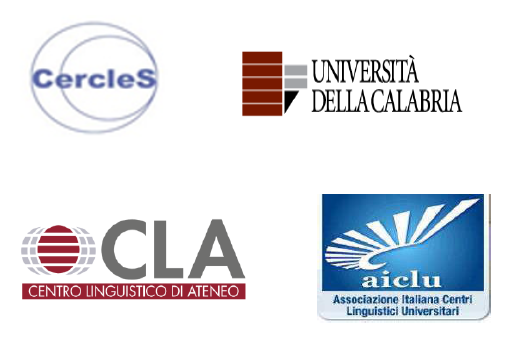 The conference will take place on 22-24 September 2016 at the University Language Centre, University of Calabria. The event aims to create an occasion for scholars, practitioners and project managers to share ideas about research and didactics related to language learning and teaching. It will focus on three strands: Applying research to pedagogical practice - Giving learners a multicultural voice - Giving University Language Centres an international voice. The Department of Aesthetics and Communication of the Aarhus University, the National Contact Point for the ECML in Denmark, has developed an ECML project publication database searchable in 4 languages (Danish, English, French and German). Apart from the ECML projects, it is intended to add other language pedagogical projects. The Pedagogical Institute of the University of St Gallen, in collaboration with other institutional partners, developed profiles of specific language competences of professionals teaching in foreign languages. Based on instruments of the ECML (European portfolio for student teachers of languages / EPOSTL, Framework of Reference for pluralistic approaches to languages and cultures / FREPA, etc.) these profiles describe language competences that are required for modern teaching within the framework of plurilingual and intercultural education. The profiles, that are common for teaching of any foreign language, are differentiated for primary and secondary levels. Pedagogical scenarios for teacher education have being designed on this basis. The use of the profiles is now recommended for teacher education in Switzerland. In the next phase of the project, the instruments will be developed and piloted for the evaluation of specific competences based on the profiles within the framework of initial and further language teacher education. The tools will then be available on an online platform. Authors: Amelia Lambelet and Pierre-Yves Mauron. The report is available in French. The hard copy version can be ordered from seamonp@edufr.ch. Ms Karine Lichtenauer (Swiss Conference of Cantonal Directors of Education / CDIP), Coordination Unit for Compulsory Education), has taken up her functions as National Contact Point for the ECML in Switzerland, replacing Mr Dominique Chételat in this function. The focus for the language experts at the recent meeting of the European Commission’s ET2020 Working Group on Transversal Skills (8-9 October 2015, Brussels) was on language testing and evaluation. In the context of the presentation of the key findings from the Eurydice report "Mapping of national testing and assessment methods" and the Cambridge English Language Assessment report "Comparability between national testing and assessment methods", the ECML was asked to present its Training and Consultancy activity, RELANG (Relating language examinations to the CEFR), one of two initiatives within the EU-ECML Cooperation Agreement entitled "Innovative methodologies and assessment in language learning". Jose Noijons, coordinator of the RELANG project, outlined the key purpose of the initiative and the ways in which RELANG addresses precisely the concerns highlighted in both the Eurydice and Cambridge reports. He also outlined the extended offer to EU and ECML member states for the academic year 2015-16. Representatives from Lithuania, Latvia and Ireland, countries where RELANG activities have taken place, gave very positive feedback on RELANG and on how they were taking the work forward at national level. Sarah Breslin, Executive Director of the ECML, added to this input by placing RELANG in the wider context of the ECML programme. She also took the opportunity to present the new initiative under the EU-ECML Cooperation Agreement entitled “Multilingual Classrooms” - workshops to support member states with the linguistic integration of migrant children in European school systems. In the framework of the European Commission’s 2015 focus on "Translating Europe" the Office of the European Commission in Vienna and the Language Network Graz organised a panel discussion on the topic "Multilingual Europe: Translating in and for multilingual communities". In recent years communities have become more aware of the acute need for interpreters and translators in Public Services and that a more professional approach is needed in this sector. The City of Graz has offered an "Interpreters’ Pool" for some time and the University of Graz is for the third time offering a course on Public Service Interpreting as well as being involved in publishing a "Training Handbook for Interpreters in asylum procedures". Quality is therefore an essential part of Public Service Interpreting, a fact stressed by Pascal Rillof, President of the European Network for Public Service Interpreting and Translation (ENPSIT), and underlined by the Secretary General of FIT-Europe, Dagmar Sanjath. Sarah Breslin, Executive Director of the ECML and prominent panel member, stressed that "despite using English as the lingua franca it is of utmost importance to foster plurilingualism as languages are the key to people". Together with the Council of Europe and its European Centre for Modern Languages (ECML), the European Commission will support the development and dissemination of new methods for language teaching in multilingual classrooms. "EDUCOMIGRANT - Collaborative Community Approach to Migrant Education"
"FREPA - Framework of Reference for Pluralistic Approaches to Languages and Cultures"
"MARILLE - Majority Language Instruction as a Basis for Plurilingual Education"
"MALEDIVE- Diversity in majority language (language of schooling) learning"
Araujo, Luísa / Dinis da Costa, Patrícia / Flisi, Sara / Soto Calvo, Elena, Languages and Employability, JRC science and policy report, Luxembourg: Publications Office of the European Union, 2015. Not interested anymore? Click here to unsubscribe.